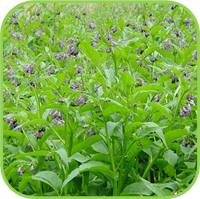 • Plant it where the growth can be controlled as it can become invasive. • ±60 cm; Spread: ±1 m.
• Pick fresh leaves throughout the growing season. • Also used as a liquid manure. • Infuse the leaf and root and add to bathwater to soften and heal the skin. Only use the leaves internally. The roots are for topical application only. • Rich source of protein. • Minerals: Ca, K, P, Fe, Mg, Mn, Se, Z. • Carpal Tunnel Syndrome: External application can relieve pain, swelling, and inflammation. Use a poultice or commercially prepared cream. • Blood sugar control: assists the function of the pancreas. • Topical: Skin irritations, itching, rough dry skin, and some cases of eczema and psoriases. • Topical: Relieve insect bites and stings. • Gargle for pharyngitis and severe tonsillitis. • Pleurisy, Bronchitis, Bronchi-pneumonia, Irritable cough, Tuberculosis. • Topical: Varicose veins, chronic varicose ulcers. • Astringent action can also contribute to improve disturbed intestinal permeability, especially in the upper digestive tract. • Reduces inflammation associated with Arthritis and Rheumatism, A massage oil to relieve stiff and aching joints. • 1 heaped teaspoon dried leaves in a cup of water, add boiling water, strain and drink after 10-15 min. Drink 3 times per day. • 2-4 ml, three times a day. 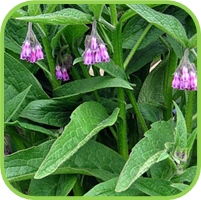 • Treatment - Rub comfrey (root) infused oil into skin over stiff and aching joints and onto scar tissue to aid healing. 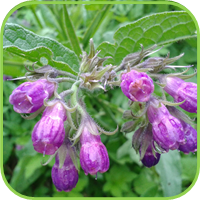 Rub comfrey ointment on areas of injury, sprains, bruises and breaks.